We like to review a wide range of DTV and HD products. Today, we’re taking a look at one of the hottest Christmas gifts of the 09 season. The Flip UltraHD Camcorder, which, at a weight of less than 1 pound, should probably have the lable, “UltraPortable” in the product name. The UltraHD features a HDMI connection which will plug into any HD capable TV set for instant viewing of pictures or movies taken with the device. What happens if your TV doesn’t have an HDMI input? No worries, the Flip comes with an flip-out USB connection to plug into your PC or Apple computer to download your videos to your hard drive or DVD disk. 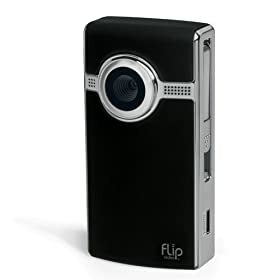 How much video can I record with the Flip Ultra HD? 2 hours. This unit comes with 8GB of built-in memory. What kind of batteries does the Flip Ultra HD come with? Rechargeable double A batteries which recharge when plugged into your computer with the USB cord that comes with the unit. Users of this devce may also be happy to hear that you can use standard AA batteries for backup if you run out of juice with your rechargeable batteries. The Good: Rechargeable batteries. 2 hours of record time. HDMI cable for watching movies on TV screen. Quick load time allows you to instantly record videos after turning unit on. The Bad: No SD Card slot???? That’s a major issue if you plan on recording more than 2 hours video at a time otherwise you’ll have to download video to a computer to continue recording. No RCA or output for standard definition TVs or TVs without an HDMI connection. The Final Verdict: The light and compact design of the UltraHD makes it the camcorder of choice for bloggers on the road and parents who want to capture special moments with their chilren. At it’s current pricing of $149.99, it’s also one of the most popular gifts this Christmas.